Chasing Love started as a meticulous look at the arrival and evolution of the idea of Romantic Love in Western society. But since the very beginning, I felt attracted by the connection that Octavio Paz establishes between capitalism and Romantic Love. During over 80 hours of interviews, I asked questions having to do with psychology, anthropology, biology, linguistics, history and philosophy. 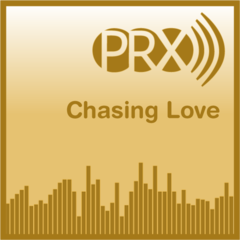 Chasing Love is a one-hour audio documentary that explores the ways late capitalism has affected and is affecting the idea of Romantic Love and consequently, the way relationships are handled and viewed in American society. In the three years it took to produce this documentary I explored the field of computer music, video art, radio drama and try to mix them all together. The results are contained in Chasing Love. Chasing Love proposes a way of conceiving a piece as a whole, where music is composed as the bits of interviews are blended together, where secrets are told behind words of narration. Where the producer is nowhere to be found and present in every second of it. Vox collage with men and women of various ages talking about their first love. I first did this vox collage in 1986 and it aired at the end of All Things Considered. It's very romantic, sweet and funny and set to "I Only Have Eyes For You..." (the old 50's version) Appropriate for Valentine's Day.